TS KGBVs PGCRTs Recruitment 2018, TS KGBVs PGCRTs Application Form Download, TS KGBVs Post Graduate Resident Teacher (PGCRT) posts Recruitment 2018, Telangana KGBVs PGCRTs Recruitment 2018, Kasturba Vidyalayas PGCRTs Recruitment 2018, Kasturba Collges PGCRTs Recruitment 2018. School Education Department, Govt Of Telangana, Kasturba Gandhi Balika Vidyalaya has given the PGCRT posts recruitment 2018 notification and application are invited from the eligible candidates for filling up the Post Graduate Resident Teacher (PGCRT) posts in the Upgraded KGBVs in the Telangana State. 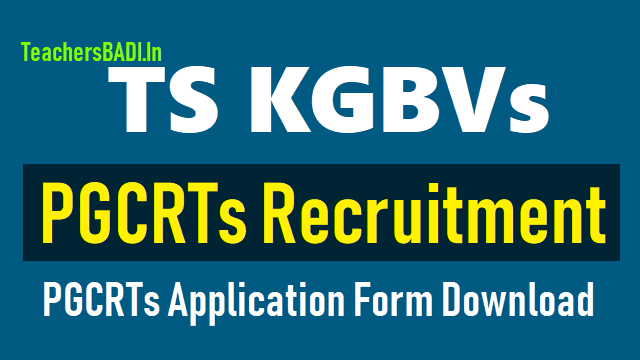 TS KGBVs PGCRT Application Form download from here. TS KGBVs PGCRTs Recruitment Guidelines, Post wise Qualifications for TS KGBVs PGCRTs, Eligibility Criteria for TS KGBVs PGCRTs and more details are provided here. Recruitment by School Education Department, Govt Of Telangana. Salary per month: Post Graduate Contract Resident Teacher (PGCRT) with monthly honorarium @ Rs.23,000/- per month. The candidate must be able to teach either in English and Telugu, if necessary. Language / Medium of Study Qualifications for Non-language subjects: The candidates who have (i) passed SSC or its equivalent Examination or Intermediate or its equivalent or Degree Examination in the medium of instruction concerned or (ii) have studied the Language concerned as First Language in SSC or its equivalent or as Part I in Intermediate or its equivalent or as Second Language in Intermediate or its equivalent or as a Subject in Degree are eligible for the posts of PG CRTin the concerned medium only. The Candidates who have obtained Degrees through Open Universities / Distance Education mode are required to have recognition by the University Grants Commission / AICTE / Distance Education Council as the case may be. Unless such Degrees are recognised by the relevant Statutory Authority, they will not be accepted for purpose of Educational Qualification. The onus of Proof of recognition by the relevant Statutory Authority that their Degrees / Universities have been recognised rests with the Candidate. Minimum 18 years & Maximum 44* years. The age is reckoned as on 01/07/2018 Minimum Age (18 years). Maximum Age (44 years). Age Relaxation: 5 years for SC/ST and BCs, 10 years for Physically Handicapped persons. iii. Caste & Community: Community Certificate issued by the competent authority (obtained from Government of Telangana State) in terms of G.O.Ms No. 58, SW (J) Dept., dt: 12/5/97 read with G.O. Ms. No. 5 Scheduled Castes Development (POA.A2) Dept., Dt. 08/08/2014, G.O. Ms. No. 11 Scheduled Castes Development (POA.A2) Dept., Dt. 17/09/2014 and G.O. Ms. No. 2 Scheduled Castes Development (POA.A2) Dept., Dt. 22/01/2015 should be submitted at appropriate time in respect of SC & ST Candidates. In respect of candidates belonging to Backward Classes are required to produce Community Certificate (BC-A, BC-B, BC-C, BC-D& BC-E) from Competent Authority i.e., from Tahsildars in the State of Telangana not below the rank of Deputy Tahsildar through E-seva/ Mee-seva (G.O. Ms. No. 16 BCW(OP) Dept., Dt. 11/03/2015) and orders and instructions issued by the Government from time to time. No person who professes a religion different from Hinduism shall be deemed a member of Schedule Caste. BC's, SC's and ST's belonging to other states are not entitled for any kind of reservation. iv. Reservation: Rule of Reservation will be applicable. viii. Reservation to the Local candidates will be applicable. The candidates claiming reservation as Local candidates shall obtain the required Study Certificates (from Class IV to Class X or SSC) (OR) Residence Certificate in the Proforma only for those candidates who have not studied in any Educational Institutions as the case may be. The relevant certificates may be got ready with authorized signature and kept with the candidates to produce as and when required. Candidates who want to apply for PGCRT post, they should fill the following details in the donwloaded application form and submit to the concerened officials. "The Last date for Submission of Online Application Form: 24-06-2018"